I've woken up from my Nightmare on C++ Street and have uploaded new Rasterio, Fiona, and Shapely macosx wheels to PyPI. Use the pip requirement specs below to get the latest and greatest compatible wheels. My Xcode command line tools were out of sync with my libraries, libc++abi.dylib in particular. 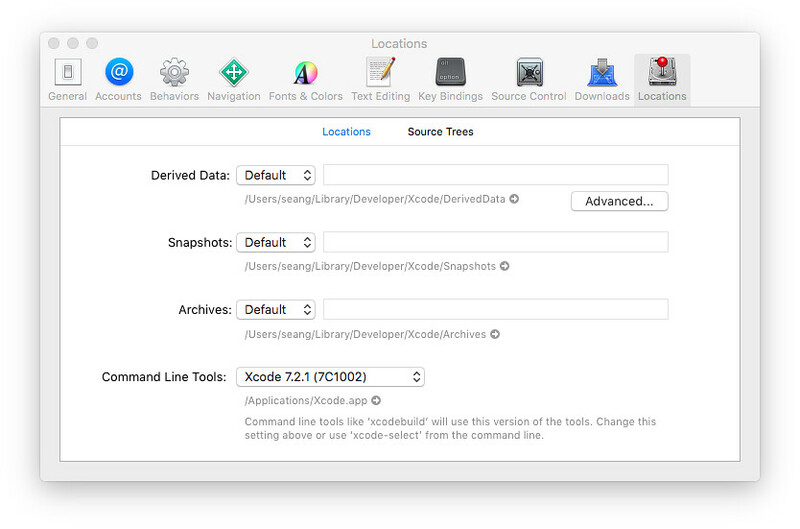 In the Xcode preferences there's an option to select versions of the command line tools. On my home computer, I've got Xcode 7.2.1 and have selected version 7.2.1 of the command line tools. On my work computer, where I've been building the wheels, I somehow ended up with Xcode 8.2.1 and version 9.0.0 of the command line tools. I've never even seen this preference before, but do remember accepting a command line tools upgrade from Apple's App Store a while back. Reverting to command line tools version 8.2.1 cleared up the segmentation faults reported and studied in https://github.com/sgillies/frs-wheel-builds/issues/20. I hope this blog post finds the next person to trip over this Xcode and command line tools mis-configuration. Now I'm going to go back into PyPI and remove the broken binary wheels for older versions, leaving only the source distributions.